Recreational boating has become far more complex than just a few short years ago, particularly marine communications. Technology that once was only available to or required onboard commercial vessels is now accessible to sail and powerboat owners. The technology has one goal: to make marine transportation safer in both commercial and recreational arenas. Today, boaters need to develop a basic understanding of available technology, to equip a boat with gear that provides the latest in search and rescue systems, and to know how to use the system in an emergency. One of the most vital new technologies is, Digital Selective Calling. Digital Selective Calling (DSC) is a monumental leap forward in marine communications, making the process of getting help in a distress far quicker and more efficient than ever before, just as the introduction of Morse code revolutionized marine communications and distress response from the early 1900s onward. DSC is part of the Global Maritime Distress and Safety System. In a distress, a DSC radio uses digital technology to send an automatic distress (Mayday) signal to the nearest Coast Guard station and to all radio-equipped vessels. The signal identifies the vessel, nature of the distress and provides contact information. When connected to GPS, the radio also transmits vessel location. All fixed-mount Very High Frequency (VHF) marine radios are now DSC-enabled; newer units can transmit a DSC test signal. In addition, many handheld VHF radios are now DSC-capable. A DSC radio has a red cover embossed with the word “Distress”; the button that activates the call is under the cover. When activated, the radio transmits a lightening fast digital signal over Channel 70. The sending radio then automatically switches to Channel 16, enabling the Coast Guard to establish voice contact with the distressed vessel. To transmit vessel position along with a distress message, it is vital that the radio be connected to an on-board GPS unit or chartplotter. 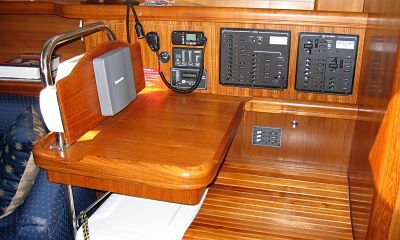 Connecting the radio to the GPS or chartplotter uses color-coded, plug-in wire connections, available from retail marine outlets or included with new radios. For proper installation, it is essential to follow instructions or to get assistance from a qualified technician. A guide to color codes and identifying numbers is helpful. Class A —­ Radio with two receivers, to receive DSC signals on Channel 70 and calls on other channels. A Class A radio offers the most features, is the most expensive, and often includes AIS functions. Class D-International — Radio also with two receivers that works the same as Class A radios, but with fewer features, making them less expensive. The Coast Guard recommends the Class D-International radio for recreational vessels. Class D-US — Radio with only one receiver; a DSC distress call on Channel 70 could be missed if using another channel. While providing DSC capability, the radio has fewer features than the International Class D version and is the least expensive. A DSC radio must be programmed with a unique identification number, called a Maritime Mobile Service Identity (MMSI). An MMSI can be obtained at no charge through BoatUS or SeaTow. After registration, vessel/owner information is entered into a database for use in distress situations. Effective DSC use faces a major challenge: the human factor. 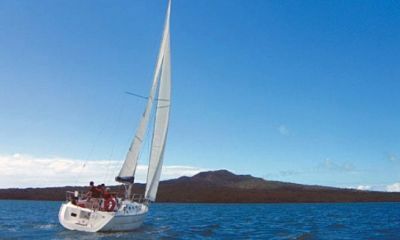 For the Coast Guard to fully utilize all DSC functions, most notably vessel location, boaters must connect the radio to an on-board GPS or chartplotter. Since DSC service began, Coast Guard surveys have indicated a serious and growing concern: fully 90% of DSC distress alerts do not contain position information. Surveys also indicate that 60% of DSC calls did not show a registered MMSI identity. The selective feature of DSC allows an operator to select and call other DSC radios. Another vessel or land station with DSC is contacted by entering the MMSI, selecting a channel on which to communicate, and pressing a button. The signal sent on Channel 70 to the called MMSI shows the selected channel for talking and switches to that channel. This is markedly different from hailing a vessel on VHF radio — any vessel or station monitoring any VHF channel can listen to the message. Using cell phones in distress situations is always a question boaters ask when discussing DSC. Simply stated, cell phones should not be the primary means for making a distress call or be a substitute for established search and rescue systems. The CG does not publicize response center landline or cell phone numbers. An initial distress call to 9-1-1 limits response effectiveness because nearby potential responders will not hear the call. By contrast, a VHF/DSC call on Channel 16 or 70 allows all mariners to hear the call and respond if possible. During search/rescue cases, the CG transmits critical case information via radio so that mariners who can respond are at least aware of the location and nature of the distress. Offshore cell phone coverage can be limited. Cell phones can be useful in distress situations, however. For example, the CG uses cell phones if the vessel in distress is not equipped with a radio or if transmission quality is poor. The bottom line about cell phone use in distress situations: they are helpful as a back up, but should not be the sole means of on-board emergency communications. Rescue 21 (often called R-21) is the Coast Guard’s high-technology system that helps locate and rescue mariners in distress and is the foundation for DSC service. The system provides the primary means for boaters in distress to contact the CG; it also tracks VHF/DSC transmissions extending 20 nautical miles from U.S. coasts and monitors Channels 16 and 70. Like DSC, R-21 is part of the Global Maritime Distress and Safety System. Communication systems now available to U.S. recreational boaters are all part of a worldwide program to improve the safety of life at sea, called the Global Maritime Distress and Safety System (GMDSS). In this country, DSC, VHF, and Single Sideband (SSB) radios, Rescue 21, AIS, and other systems are GMDSS components. In theory, any radio-equipped recreational vessel on U.S. navigable waters is a de-facto part of GMDSS. For example, a 40-foot day cruiser could become involved in responding to a fire aboard a 500-foot, foreign-flagged tanker. In practice, the Coast Guard would likely handle the distress, but all boaters are required by federal law to render some level of assistance in emergencies. For boaters in foreign waters, the system works in much the same way as in U.S. waters. Another point about federal law: recreational vessels with a VHF or DSC marine radio and operating in U.S. or foreign waters must maintain a radio watch on Channel 16 whenever the radio is on or not in use on other channels. Additional requirements apply to recreational boats over 65 feet and operating in a Vessel Traffic Service area. The Coast Guard and other agencies broadcast a range of information that can be useful to recreational boaters, described below. Marine Assistance Request Broadcast (MARB) — Broadcasts to assist boaters in non-emergency situations. Typical non-emergency calls include: no fuel, loss of steering, dis-masting, engine problems, or similar situation not posing an immediate safety threat to passengers or the vessel. The Coast Guard will obtain information about the vessel and the issue, then make an Urgent or Safety call on Channel 16, which direct mariners to Channel 22A for details. Broadcast Notice to Mariners (BNTM) — Regularly scheduled messages of local interest to all mariners, which can help recreational boaters avoid potentially dangerous situations. BNTMs are announced on Channel 16; details are delivered on Channel 22A. Topics can include notices of safety zones around ships carrying hazardous cargo, channel closures, regattas, damaged buoys, or flotsam in channels. Weather Radio — A 24-hour radio network broadcasting local weather forecasts and warning/watch alerts, operated by the National Weather Service. The Wx (weather) button on VHF radios connects to Wx Channel 1, used for most broadcasts. The Automatic Identification System (AIS) is relatively new technology now available to recreational boaters. Like aircraft transponders, the system displays real time locations of AIS-equipped vessels, as well as vessel name, course, speed, and other data. AIS is expensive, needs a special antenna and is not required on recreational vessels under a certain length. Boaters should develop a basic understanding of the available technology in search and rescue systems and, of course, know how to use it in a distress situation. Before departure, check with the owner about on-board electronics, including VHF/DSC radio operation. The Internet is awash with sites that describe DSC; one of the best is “Can You Hear Me?” sponsored by the BoatUS Foundation. If installed properly and used as intended, DSC takes the search out of search and rescue. To afford every opportunity to be located in an emergency, sail and powerboat vessels should be equipped with a DSC/VHF radio which is programmed with the MMSI, and most importantly, connected to an on-board GPS unit or chart plotter. Safer boating means more fun for everyone out on the water.